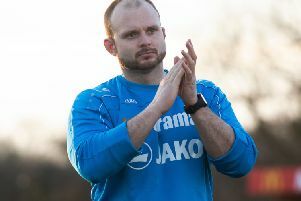 Captain marvel Jordan Parkes was the hero yet again as Hemel Town rescued a point late on against the old enemy, St Albans City, on Boxing Day. The hosts took the lead with 32 minutes on the clock when David Keenleyside played a pin-point through-ball to Frendo, who took a touch before dispatching an excellent shot past Tudors keeper Laurie Walker. The Saints could have been two goals up by the interval, but the normally unstoppable Frendo failed to convert when he rounded Walker with the goal at his mercy. After the break, the Saints began to sit back and, as the half wore on, Hemel found a foothold in the game. Dean Brennan’s side continued to press for a leveller and the equaliser duly arrived with just a minute left on the clock. A ball into the City box was only half-cleared by the defence and it fell to Tudors talisman Parkes, who let fly with a trademark thunderbolt from 25 yards that left Saints keeper Joe Welch powerless as it scorched into the top corner of the net. The draw means Hemel and City stay closely matched in the Vanarama Conference South, with the fierce rivals ready to meet again on New Years Day at Vauxhall Road.